Whether you prefer the cool crunch of a sweet bell pepper or the feisty fire of a chilli pepper, there’s none more satisfying than those you’ve grown yourself. There are – literally – hundreds of varieties to choose from; deciding what to grow is half the fun! Few crops come in the variety of shapes, sizes and, of course, heat levels as peppers and chilli peppers. With so many to explore, there’s always something new to enjoy. Grow them yourself and you’ll be able to harvest at the peak of perfection, so you can enjoy unrivalled flavour. Peppers love sunshine, so reserve them a place in full sun where they will get at least six hours of direct sunshine every day. Acclimatise plants before setting them outside by leaving them out somewhere sheltered for gradually longer timespans over a two-week period. Take care that a late frost doesn’t accidentally damage them! Plant out once your last expected frost date has passed. 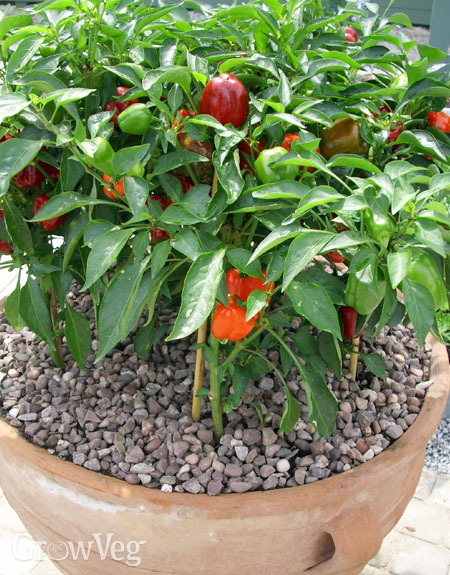 Plant peppers directly into open ground that’s been improved with plenty of organic matter, such as garden compost. Set plants a minimum of 16in (40cm) apart. You can also plant into containers that are at least 1.5 gallons (6 litres) in volume. Use good-quality potting soil enriched with added organic matter and plant the young peppers so that the soil surface reaches just shy of the rim. This will help to avoid runoff every time you water. In cooler, temperate climates peppers will come into flower far quicker if they are grown on with the added protection of a greenhouse, polytunnel or conservatory. Plants may also be grown on a bright, sunny windowsill. Once they start producing flower buds feed plants regularly with a liquid feed high in potassium, such as a tomato fertiliser. Water plants often in dry weather so the foliage doesn’t wilt, as this can cause undue stress and potential problems such as blossom end rot or leaf curl. In hot weather you may find you need to water daily. A tray or similar reservoir at the bottom of pots helps to contain the water that drains through so it can be fully absorbed back up through the drainage holes. Peppers are ready to harvest as soon as they have taken on their final color. Cut the fruits away with a sharp pair of clean pruners then store in the refrigerator ready to enjoy. They freeze well too. Chilli peppers may also be dried then pulverized in a food processor to store as chili flakes in airtight jars.